Workers at the Kennedy Space Center will roll the space shuttle Endeavour from launch pad 39B to 39A Thursday in advance of a mission to the International Space Station targeted for November 14. Space shuttles Atlantis, left, and Endeavour on their launch pads last month. Endeavour has been undergoing preparations for launch on pad 39B for the past month. 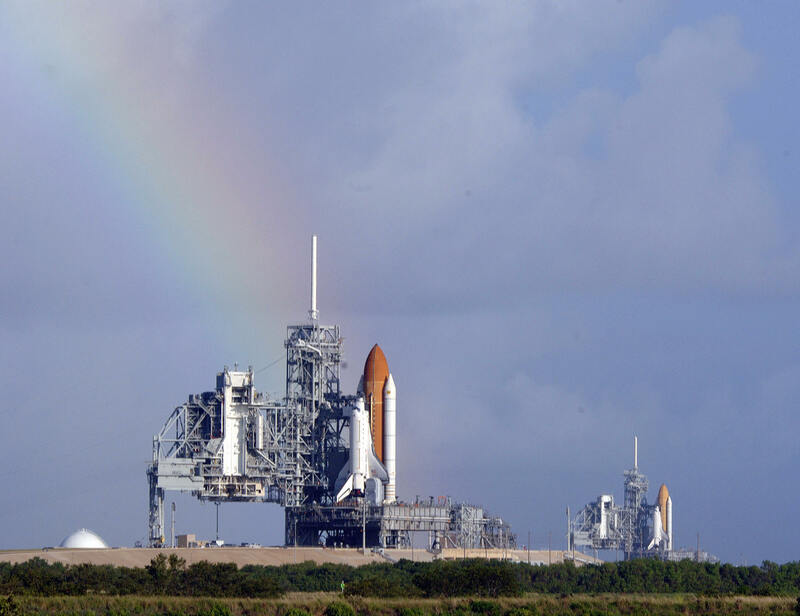 For a time, it was second in line for launch behind Atlantis on pad 39A, which had been scheduled to fly the fifth and final Hubble Servicing Mission this month. A Hubble mission carries additional risk because astronauts cannot take refuge in the space station in the event of Columbia-style catastrophic damage to the orbiter on lift-off. So before the final Hubble mission was approved, NASA managers decided it would only be safe to fly if a rescue vehicle was prepared and ready to launch on very short notice. Endeavour was to have been that rescue vehicle. The Hubble launch was postponed in late September due to a computer failure on the telescope. Mission managers now want to replace that computer - but the spare needs to be prepared for flight, and the astronauts need time to train on how to do the replacement. The Hubble mission is now scheduled to fly no earlier than February. Workers rolled Atlantis back from pad 39A to the vehicle-assembly building on Monday. Launch pad 39B, where Endeavour is currently located, it being modified to launch NASA’s next generation of manned spacecraft called Orion. While it is still technically possible to launch a space shuttle off 39B, NASA would prefer to keep the modification work underway – which is not possible when there is a shuttle parked there. So the launch team has opted to move Endeavour from 39B to the now empty 39A, and allow the construction work on 39B to resume. Endeavour’s crew, led by Commander Chris Ferguson, will carry up additional equipment and supplies to the space station that will make it possible to expand the station crew from three to six people next year. Spacewalkers will also work on a malfunctioning rotator joint on the left side of the station that is designed to rotate and track the sun. It has been out of commission for the last year, and complete repairs will continue into 2010. But station engineers hope the Endeavour astronauts can make it functional again. it seems like a logistical error. why didnt they put the atlantis on 39b. it seems that would of protected the orion schedule more without affecting the regular shuttle mission. The way I read it: there were two shuttle missions scheduled almost simultaneously. If 39B is the one they will upgrade to accommodate Orion, and there is now only one shuttle mission in the near future, they can have 39B empty and continue the upgrades. Unless, of course, they are going to upgrade 39A for Orion as well. In that case, I see your point. I am very excited to see the next phase in our space exploration, either way. This blog would be much less painful if the images were shrunk to a 200×350 thumbnail before publishing, rather than including a 4000×3000 pixel megabyte image in each post, then having the browser shrink it down to a thousandth of the size after downloading it. uTube; "Deirdre Flint The Metric System"
Astronauts are very brave, or very smart ? Would you ride in a car designed with slugs ? Absolutely not ! Or, how extreme the discount ? NASA has 2 pads from which it can launch shuttles: 39A and 39B. 39A is used as the primary launch pad, but with NASA needing a shuttle ready to launch in case of a problem with the main flight it uses 39B as the launch pad for that flight. Since Atlantis' mission was pushed back and the orbiter rolled back to the VAB, Endeavour was moved from 39B to 39A in preparation for it's own flght. At that time Discovery (most likley) will be rolled out to 39B as the possible rescue flight if needed. Awesome picture!! Love the rainbow!! i thought this article was about billionaire contractors. boo. Given the history of flights they need to focus on Orion. The real space race is between India and China. Tofu or Curry, Fried or Steamed Rice ? everyone has it in their head that orion will be so much safer than the shuttle but if managment had listened challenger and columbia accidents would have been prevented. orion has the same risk for an accident the shuttle is getting the blame for everything because its their way to retire it easily in the publics eves. The shuttles are old and the government has turned its back on technology. It's way past due for a new ride into space and the Orion should take priority over everything else. It's sad that NASA has been so underfunded that it is starting to become an organization completing their work with relics. It's interesting to note how the (conversely) advanced, Glide-home winged shuttle design was once and for all lost to it's predecessor, a time proven Missile and Payload design not too different from the Nazi V2 and the launch vehicles that were used in the Gemini and Apollo programs. The russian R7 Rocket launched the soviet sputnik 51 years ago and today still hauls Russian Cosmonauts, American Astronauts and wealthy space tourists into orbit. Technology wise, To me it is almost as sad as retiring the Concord. On the other hand, Safety prevails. I really hope Orion would prove to be a safe, efficient system that could put the US back on the map again ! I think it says a lot about the current state of our space program to have a photograph of two shuttles side by side getting prepped for launch. It also says a lot that both the original missions are scrubbed, they're moving the shuttles, and only one will be launching. Nevertheless I think we can remain cautiously optimistic that interest in space will probably not wane any time in the near future given the amount of attention starting to come from the private sector.